On Sunday June 17th at 5:00PM the Prior Lake Mariners will be dedicating a bench on the fan deck at Veterans Field in honor of the late Jerry Maas to recognize his contributions to Senior Mens baseball in Prior Lake. I first met Jerry in 2003 or 2004 when he was an officer on the Board of the Minnesota Senior Mens Baseball Association and he’d asked me about trying to form a team in the 35 & over league for MSMABA for the 2004 season. We posted a story on our web and put info in PL American but were not getting enough feedback to sustain a team. 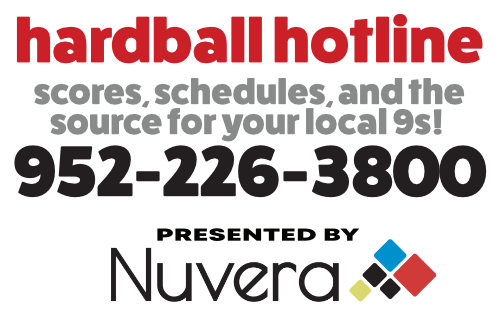 They had a team not able to participate in their 2004 State Tournament and he asked if I could make some calls to try to form a team as the “bracket” was constructed in a way that allowed 4 games to be guaranteed over the 2 weekend run of the Tournament (A NASA Engineer is needed to read it for the unfamiliar). I reached out, made calls and think we probably had 4 different rosters in each of the 4 games for our “Guest Team” but had a good time reconnecting with long time friends and former team mates which included some PL alumni, Faue, Rooney, Simmering to name a few along with some DRS opponents Masburg, ONeill, Bruder from Union Hill. I brought some old PL Mudcats tops for us to wear so we looked like a team. They did impose a “no metal bat” rule as most that played were still active in MBA townball which had transitioned to wood bats but we did our job, played the games and had a good time getting some additional baseball games that Summer. Jerry resided in Credit River Township and had served as its Township Clerk. Following the 2004 Tournament he had, I think, attended PLABA off season meetings hoping to have someone with local connections lead the effort to form a team and in 2005, with a loan from PLABA to assist startup cost and some excess equipment from townteams (I was Mudcats player/GM and also supported Jays operations informally), PL’s 35 & Over MSMABA was formed. 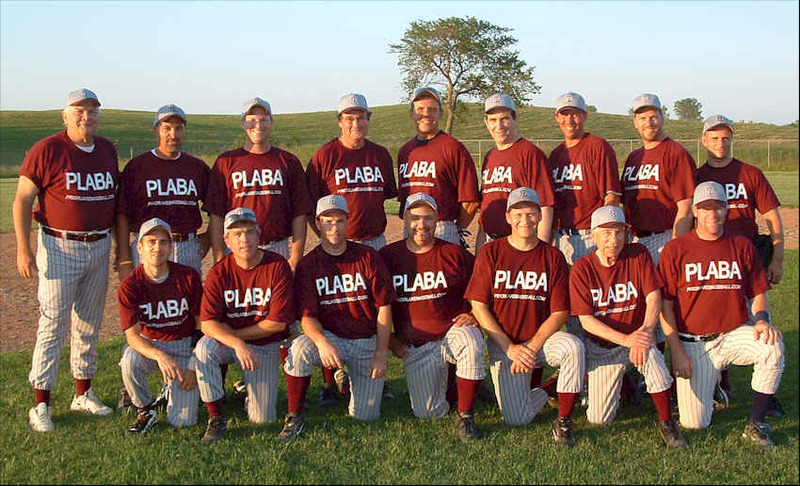 PLABA, who coordinates operations among user teams, was started from Jays & Mudcats and the prospect of former townball players assisting with operations made sense as it had shown to be a successful model in other townball locales such as Jordan, Union Hill, Veseli and others where former players would follow the 2PM townball game with 35 & over games. Jerry assisted with administration of the early teams and would “count noses” leading up to games to help ensure we had players ready and as I had to explain to more than a few was fearless to get a good camera shot as he would literally stand as close as 15-20 feet behind batters & umpires “in play” to get photos for the MSMABA website that he also presided over. If you browse the MSM website you can see many of his pictures. Jerry did have a great love for the game, players, parks that showed in his work on the State MSM Board. He was inducted in their Hall Of Fame and a plaque hangs in Clancys Bar in Jordan for his efforts over many years. Following the establishment of the team, I proposed calling them the “Codgers” and emulating the famous LA Dodgers script on the tops but Jerry hated it, we went to “MudBird” recognizing the surplus equipment that the Jays and Mudcats townteams gave to help make the team possible. Many teams in the MSM have humor in their names reflecting the older players participating. Following my tenure as player GM it evolved to the “Mariners” of today and a 2nd team, the Pacers, started up and played until 2018 in Prior Lake. Jerry jumped into PLABA operations and was elected C0-Treasurer then sole Treasurer and came to PL at a critical time when we were generating enough income to invest into our facility, Veterans Field. His experience was valued in organizing PLABA finances and provide the detail needed for improvements such as the Fan Deck (2011), Scoreboard (2012) and field equipment that have benefited the community. His wife Connie would assist with operation of Concessions as games and her positive personality and smile was always welcoming. Jerry attended many Jays, Mudcats and Lakers games and had season tickets for the Twins and would share his photos from his prized seats above 1st base dugout. He truly had a passion for the game that inspired the current Mariners GM Bill Gabler to pay tribute to his contributions to MSMABA, PLABA and Prior Lake Mariner baseball coordinating dedication of a fan bench to honor him. When Jerry and Connie moved to Florida in recent years, there was a void at “the Vet”. His smile and laugh will be missed by those who knew him, but his legacy will endure in the Prior Lake baseball community. Please join the Mariners Sunday June 17 for 5:00PM Dedication to be followed by a game between the Mariners and Jerrys former team, the St Louis Park Cardinals. “Vet Cafe” will be open and no admission is charged. 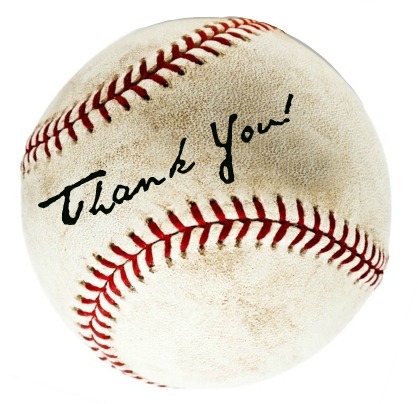 Thank You Jerry & Connie Maas from the Mariners and PLABA! Next Post:Happy 4th of July!